I know.. Cauli again! I promise something different this weekend though as I am doing a few new dishes for a dinner party. 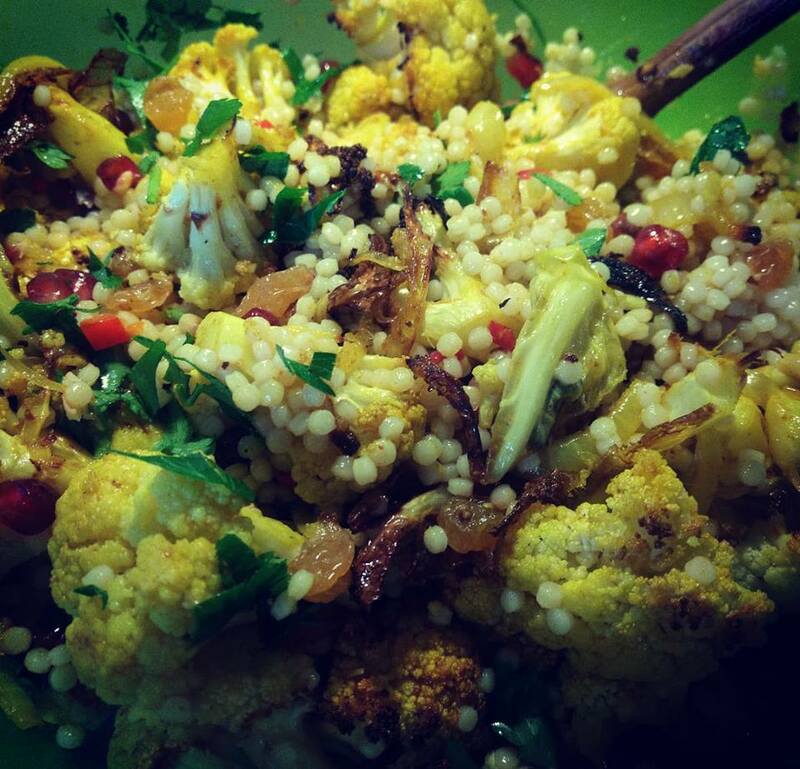 But for now – another cauli salad but I think this is the best one yet! Pre heat oven to 190 fan/170/gas mark 5. Prepare the cauliflower for roasting by removing the large outer leaves ( keep the small tender ones next to the florets for roasting as they taste lovely when crispy) break into florets and mix in a bowl with the sliced onion, 2 tbsp olive oil, tumeric, cumin and garlic paste. spread evenly on a baking tray with the tender leaves and roast for 20 – 25 minutes until soft. A little charring is good for taste! Leave to cool. Toast your pine nuts by cooking in a dry pan for a minute until starting to go brown. While this is roasting, prepare the cous cous by simmering in salted boiling water until soft. Drain, cool and then put into a bowl with the crushed garlic, lemon juice, 1 tbsp olive oil, salt and pepper, raisins, chilli, pomegranate seeds and toasted pine nuts. Mix the roasted cauliflower and onion in with the couse cous, stir well and scatter the fresh parsley and crispy onions over the top. Next Lily’s Vegetarian Restaurant Review.